G. Vantongerloo, De Stijl, August 1918, no. II (larger version illustrated, pl. XVI). F.W. Haller, "Kandinsky, Archipenko, Chagall," Die Bildenden Künste, 1920, vol. IV, p. 180, nos. 11-12 (larger version illustrated). T. Däubler and I. Goll, Archipenko-Album, Potsdam, 1921 (larger version illustrated, pl. 5). M. Seuphor, La sculpture de ce siècle, Dictionnaire de la sculpture moderne, Neuchâtel, 1959, p. 357 (larger version illustrated, p. 26). A. Archipenko, Archipenko, Fifty Creative Years 1908-1958, New York, 1960, no. 142 (larger version illustrated). G. Habasque, "Archipenko," L'Oeil, June 1961, p. 44, no. 78 (larger version illustrated). Y. Taillandier, "Conversations avec Archipenko," XXe Siècle, 1963, no. 22 (larger version illustrated). F.S. Wight, "Retrospective for Archipenko," Art in America, May-June 1967, vol. 55, no. 3, pp. 65 and 67 (another cast illustrated, p. 67). D.H. Karshan, ed., Archipenko, International Visionary, Washington, D.C., 1969, pp. 17, 19-20, 47 and 49 (another cast illustrated, pl. 47). D.H. Karshan, Archipenko, The Sculpture and Graphic Art, Tübingen, 1974, pp. 11-12, 15, 18, 23, 32, 36, 149 and 156 (larger version illustrated, pp. 10 and 149). B. Dorival, "Les Omissions d'Archipenko et de Lipchitz," Bulletin de la Société de l'histoire de l'art française, 1974, p. 206, no. 34 (larger version illustrated, p. 208). K.J. Michaelsen, Archipenko, A Study of the Early Works 1908-1920, New York, 1977, pp. 97-98 and 178-179, no. S54 (larger version illustrated). D.H. Karshan, Archipenko, Sculpture, Drawings and Prints 1908-1963, Danville, Kentucky, 1985, pp. 4, 79 and 185. M. Frank, "Return Engagement, An Eclectic Design for a Classic New York Apartment Evolves Over Two Decades," Architectural Digest, November 1998, pp. 246-253 (larger version illustrated). J. Leshko, Alexander Archipenko, Vision and Continuity, New York, 2005, p. 246, no. 35 (larger version illustrated in color, p. 62; illustrated again, fig. 8). Gondolier was among the four Archipenko sculptures featured at the spring 1914 Salon des Indépendants, an event that heralded a pivotal moment in the artist's career and earned him celebrity as the first Cubist sculptor. Since arriving in Paris in 1908, Archipenko had moved away from his pared down monoliths to emphasize an increasingly Cubist vernacular of abutting planes, quotidian materials, and polychrome. By embracing negative space as an active element of sculptural articulation, Archipenko drew a new equivalent between the dialectics of plane and shadow in two-dimensional media and the play of presence and absence implied by concave and convex shapes. Alfred H. Barr, Jr., the first director of The Museum of Modern Art, described Archipenko in 1936 as "the first to work seriously and consistently at the problem of Cubist sculpture" (Cubism and Modern Art, exh. cat., The Museum of Modern Art, New York, 1936, p. 104). Gondolier evinces the transformation of shape into geometry. The radical fusion of a gondolier's leg and pole into one dynamic diagonal adds thrust to the static sculpture, suggesting movement in three-dimensions. 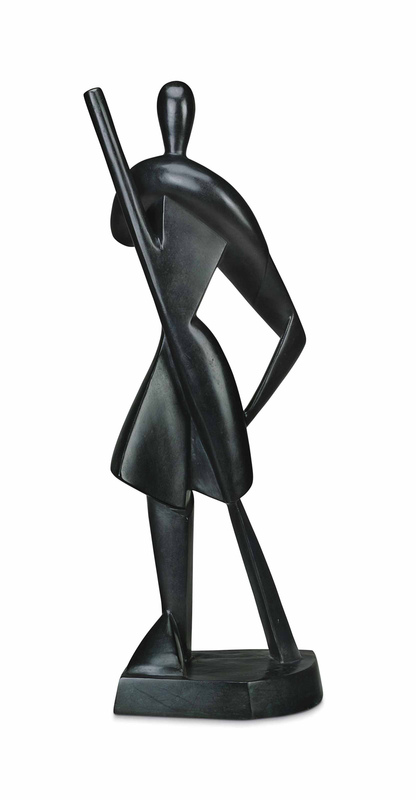 It is a quintessential example of Archipenko's work from his early period. Casts of the motif are in the collections of the Hirshhorn Museum and Sculpture Garden and The Museum of Modern Art, New York. Katherine J. Michaelsen has written; "In retrospect, the years 1913 and 1914 stand out as the creative high point of Archipenko's early period. His most successful and important sculptures, among them some unqualified masterpieces were created in these two years. Incorporated into these works are all of the significant sculptural innovations that earned Archipenko a position among handful of pioneers of modern sculpture" (op. cit., pp. 45-46).